L awyer Joseph Groia has vowed to take his fight with the Law Society of Upper Canada to the Supreme Court. The case, which was recently dis- missed by the Ontario Court of Appeal, has sparked concern from some in the legal community that the proceedings could affect the way trial lawyers defend their clients. Groia says the proceedings have had a "chilling effect" on advocates. "It's very difficult to put a defence law- yer in a position where he or she has to be looking over their shoulder for fear that the judge is allowing things to unfold, but a regulator wants to come along and second-guess that," Groia says. The Court of Appeal recently dis- missed Groia's appeal of a law society de- cision to discipline the lawyer for conduct during a trial it determined was uncivil and unprofessional. "The requirement of professionalism for lawyers, both inside and outside the courtroom, including zealous advocacy accompanied by courtesy, civility and good faith dealings, secures the nobility of the profession in which lawyers in this province are privileged to practise," Jus- tice Eleanore Cronk wrote in a whopping 110-page decision. "The appeal panel concluded that this requirement was breached in this case." Others say the decision simply lays out the fact that there are limits to zeal- ous advocacy. Trevor Farrow, a law professor with Osgoode Hall Law School, says he does not believe the decision will affect law- yers' ability to forcefully defend their cli- ents, as it does not take away their right to zealously advocate. "Nothing in this decision jeopardizes an advocate's current ability to strongly and forcefully advocate on behalf of their clients," Farrow says. "I think what it does do is simply re- mind us all that the code of conduct in- cludes provisions for robust advocacy, but they also include a lot more and, in my view, to date we have often privileged provisions and expectations of robust advocacy and for some reason either ig- nored or downplayed equally compelling obligations to others and to the court," he added. 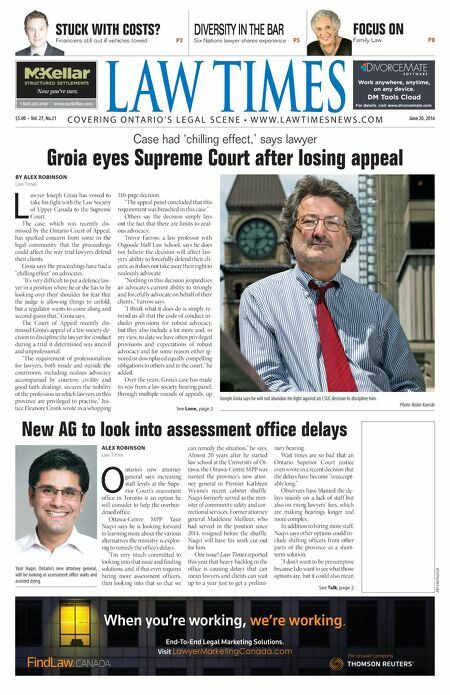 Over the years, Groia's case has made its way from a law society hearing panel, through multiple rounds of appeals, up Case had 'chilling effect,' says lawyer Groia eyes Supreme Court after losing appeal BY ALEX ROBINSON Law Times New AG to look into assessment office delays ALEX ROBINSON Law Times O ntario's new attorney general says increasing staff levels at the Supe- rior Court's assessment office in Toronto is an option he will consider to help the overbur- dened office. Ottawa-Centre MPP Yasir Naqvi says he is looking forward to learning more about the various alternatives the ministry is explor- ing to remedy the office's delays. "I'm very much committed to looking into that issue and finding solutions, and, if that even requires hiring more assessment officers, then looking into that so that we can remedy the situation," he says. Almost 20 years after he started law school at the University of Ot- tawa, the Ottawa-Centre MPP was named the province's new attor- ney general in Premier Kathleen Wynne's recent cabinet shuff le. Naqvi formerly served as the min- ister of community safety and cor- rectional services. Former attorney general Madeleine Meilleur, who had served in the position since 2014, resigned before the shuff le. Naqvi will have his work cut out for him. One issue? Law Times reported this year that heavy backlog in the office is causing delays that can mean lawyers and clients can wait up to a year just to get a prelimi- nary hearing. Wait times are so bad that an Ontario Superior Court justice even wrote in a recent decision that the delays have become "unaccept- ably long." Observers have blamed the de- lays mainly on a lack of staff but also on rising lawyers' fees, which are making hearings longer and more complex. In addition to hiring more staff, Naqvi says other options could in- clude shifting officers from other parts of the province as a short- term solution. "I don't want to be presumptive because I do want to see what those options are, but it could also mean STUCK WITH COSTS? Financiers still out if vehicles towed P3 DIVERSITY IN THE BAR Six Nations lawyer shares experience P5 FOCUS ON Family Law P8 See Talk, page 2 See Lone, page 2 PM #40762529 $5.00 • Vol. 27, No.21 June 20, 2016 L AW TIMES & $#&!&jmmm$cYa[bbWh$Yec ntitled-4 1 12-03-20 10:44 AM C O V E R I N G O N T A R I O ' S L E G A L S C E N E • W W W . L A W T I M E S N E W S . C O M DM Tools Cloud For details, visit www.divorcemate.com. Work anywhere, anytime, on any device. ntitled-2 1 2015-11-04 9:23 AM When you're working, we're working. End-To-End Legal Marketing Solutions. Visit LawyerMarketingCanada.com Untitled-2 1 2016-06-16 8:13 AM Joseph Groia says he will not abandon his fight against an LSUC decision to discipline him. Photo: Robin Kuniski Yasir Naqvi, Ontario's new attorney general, will be looking at assessment office waits and assisted dying.